The London premiere of six-time Tony Award-winning musical The Light in the Piazza comes to Southbank Centre’s Royal Festival Hall in Summer 2019. This new production will feature “the most intensely romantic score of any musical since West Side Story” (NY Times) performed by Opera North’s 40-piece onstage orchestra. Designed by Rob Jones (RSC, Royal Opera House) for the Royal Festival Hall’s breathtaking stage, The Light in the Piazza will sweep you off your feet as it transports you to a beautiful, sun-drenched Italian piazza. The Light in the Piazza is booking from 14 June 2019 until 5 July 2019 at Royal Festival Hall, Southbank Centre, London. The cast is led by four-time Grammy winner and Tony nominee Renée Fleming as Margaret Johnson and Dove Cameron as Margaret’s troubled daughter Clara; she is best known for her role in Disney’s The Descendants trilogy, recently starred as Amber von Tussle in NBC’s Hairspray Live! and is currently starring as Cher in the Off-Broadway production of Clueless: The Musical . The cast also features Alex Jennings, Rob Houchen, Celinde Schoenmaker, Liam Tamne, Marie McLaughlin, Malcolm Sinclair, Matthew Woodyatt, Rhona McGregor, Tom Partridge, Molly Lynch, Nicholas Duncan, Chlöe Hart, Danny Becker, Monica Swayne and Simbi Akande. 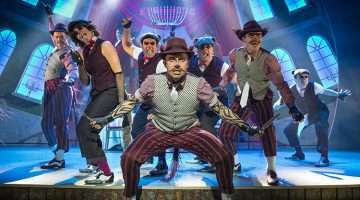 Directed by Daniel Evans with set design by Rob Jones, costume design by Brigitte Reiffenstuel and lighting design Mark Henderson. The Light in the Piazza has a book by Craig Lucas and music and lyrics by Adam Guettel. Buy The Light in the Piazza tickets at the Royal Festival Hall by using the Search Box at the top of the page or by clicking the Buy Now button above. You will be purchasing tickets via our preferred ticketing partner Encore Tickets, who are a fully bonded and licensed ticketing company and members of STAR - the Society of Ticket Agents and Retailers. 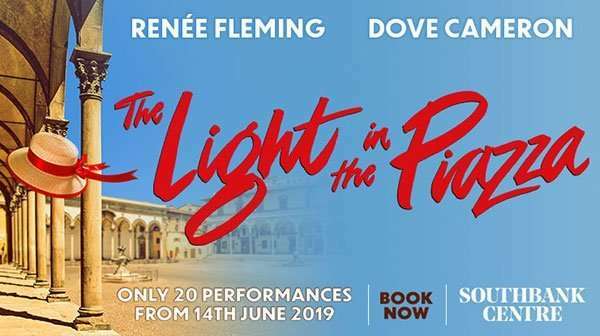 Encore offer real-time ticketing with confirmed seat locations at the time of booking so you know your seat numbers before you book your The Light in the Piazza tickets. Why book The Light in the Piazza tickets with us?